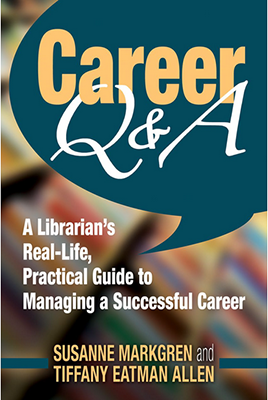 Career Q & A: Book talk and reception with Susanne Markgren and Tiffany Eatman Allen on Thursday, November 7, 2013 at the CUNY Graduate Center. METRO is collaborating with ARLIS/NY, ACRL/NY and other local library organizations to host a book talk and reception with Susanne Markgren and Tiffany Eatman Allen, authors of Career Q & A:A� A Librarian’s Real-Life Practical Guide to Managing a Successful Career. book signing.A� Refreshments will be provided. Other local organizations have generously helped to make this event happen at no charge, including:A� InfoToday, New York Technical Services Librarians, the New York Library Club, SLA NY and The New York Society Library.